To explain that Three is the only network enabling customers to use their phones in 16 foreign countries at no extra cost, thereby encouraging people to switch to Three. We noticed that when people are on holiday they love nothing more than using social media on their phones to brag to people back home (the sunsets, the beach feet, cocktails, the plane wings, the travel selfies…) By liberating Three customers to use their phones abroad at no extra cost we realised that we would be adding to the epidemic. So Three needed a campaign that could tackle the ‘problem’ they had inadvertently created. We launched with a spoof public apology to the nation on behalf of our happy customers who are now using Feel at Home to post holiday spam abroad at no extra cost. The apology was made public through TV, online films, outdoor, print and social media. Post apology we then made a concerted effort to clean up our mess through a social media outreach campaign featuring a ‘tag a bragger’ competition. We surpassed targets for the number of existing Three customers using data roaming by 36% in the three months post-campaign launch. And new Three customers used more data roaming too – by 125%. During the month of the campaign footfall at Three stores increased 3.9%. 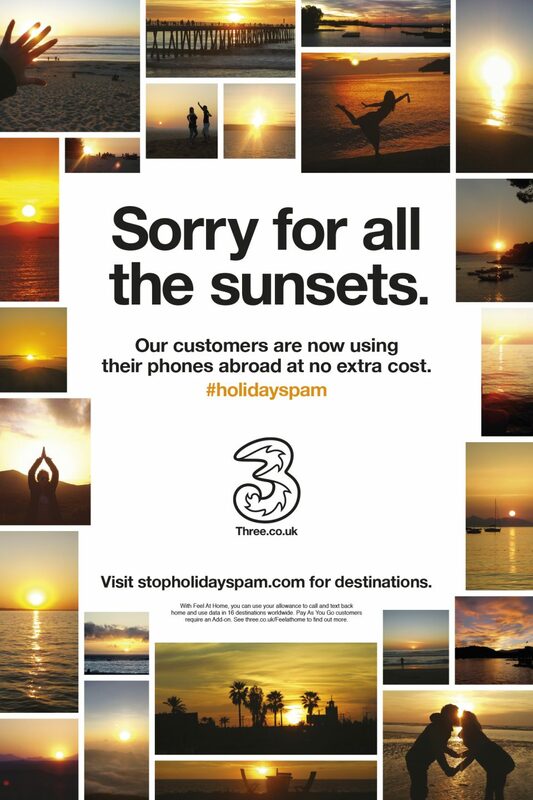 Holiday Spam was the UK’s #1 most awarded campaign for effectiveness in 2015, according to the WARC 100, and in addition won a gold at the first UK Effies Awards in 2016.